This year’s Eagle panel held honorees Lt. Col. (Ret.) 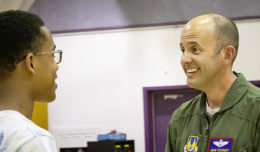 Tony Bevacqua, U-2 and SR-71 instructor/test pilot; Lt. Col. (Ret.) David Kerzie, U-2 chief test pilot for Lockheed Martin; Col. (Ret.) Robert Rowe, U-2 chief test pilot for Lockheed Martin; Col. (Ret.) Louis Setter, U-2 instructor/test pilot; and Lt. Col. (Ret.) Ed Yeilding, SR-71 instructor/test pilot. 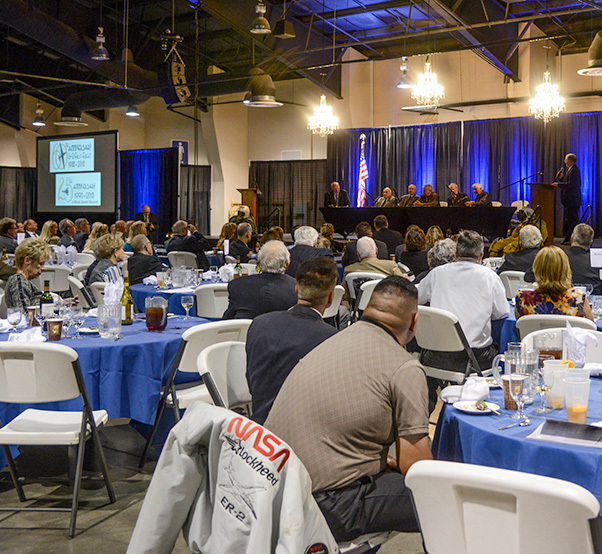 LANCASTER, Calif.–The Flight Test Historical Foundation honored U-2 and SR-71 pilots during the annual Gathering of Eagles dinner at the Antelope Valley Fairgrounds Oct. 24. This year’s theme was commemorating the 60th anniversary of the first flight of the U-2 and the 25th anniversary of the SR-71 Smithsonian Speed Run. “The efforts of the men we honor tonight provided the United States and many of our allied nations with imagery and intelligence data that kept our nation safe. U-2 and SR-71 missions put U.S. eyes in the sky keeping tabs on those who would do us harm; keeping them honest and engage in diplomacy rather than war,” said Lisa Gray, Flight Test Historical Foundation Board of Directors chairwoman. The annual Gathering of Eagles dinner is also about raising funds that will ultimately contribute to moving the Air Force Flight Test Museum outside of the Edwards AFB west gate, which would provide easy access for the public. 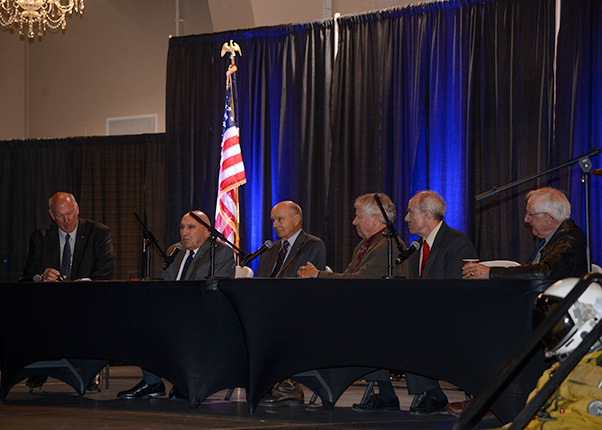 The 2015 Gathering of Eagles was held at the Antelope Valley Fairgrounds. This year’s theme was commemorating the 60th anniversary of the first flight of the U-2 and the 25th anniversary of the SR-71 Smithsonian Speed Run. During the evening, Gray announced that due to a $300,000 matching grant from the Conrad Hilton Foundation, the Flight Test Historical Foundation has raised enough to break ground. One large pledge of $50,000 came from the Glen and Lois Jamieson Family Fund. Throughout the night, money was raised through gift shop sales and auctions. 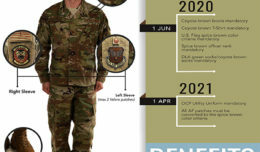 Volunteers, Staff Sgt. Christopher Porter and Airman 1st Class Cory Bond from the 412th Communications Squadron, along with Capt. Lien Tran and Senior Airman William Walker from the 412th Aerospace Medicine Squadron, showed items during the live auction and helped Little Rock High School JROTC cadets with the silent auction. An online auction will continue to be available through Nov. 6 at www.edwardsmuseum.org. Each year the foundation announces the recipient of the C. Gordon Fullerton Memorial Scholarship. The 2015 scholarship in the amount of $2,000 was awarded to Joseph Lopez, a senior in mechanical engineering at California State University Long Beach who is enrolled in the university’s accredited Antelope Valley Engineering Program. Bill Flanagan, was also recognized as the FTHF volunteer of the year. Flanagan, who flew the SR-71 as well as the B-2 for Northrop Grumman, now volunteers at Blackbird Airpark at U.S. Air Force Plant 42 in Palmdale, California. The park is an extension of the AFFT Museum and is run entirely by volunteer efforts. 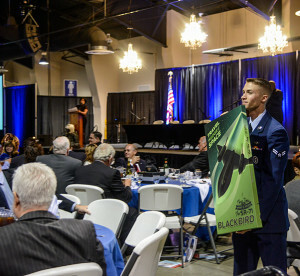 Airman 1st Class Cory Bond, 412th Communications Squadron, shows a poster of the SR-71 during the live auction at the annual Gathering of Eagles. The 2015 Eagles were able to offer their personal experiences with the U-2 and SR-71. Guest speaker Melani Austin, Lockheed Martin Skunkworks U-2 program manager, was able to speak about the U-2 today. “Sixty years of operational excellence really has more to do than just putting a plane in the air,” Austin said. Every Eagle that is honored during a Gathering of Eagles event is remembered in the program booklet each year that follows. A special video montage was shown this year in memoriam of Eagles who had died within the last year. One of those Eagles who passed last June, Charlie Van Norman, worked at Edwards for 34 years with his last civil service position as a senior technical adviser in 1998. 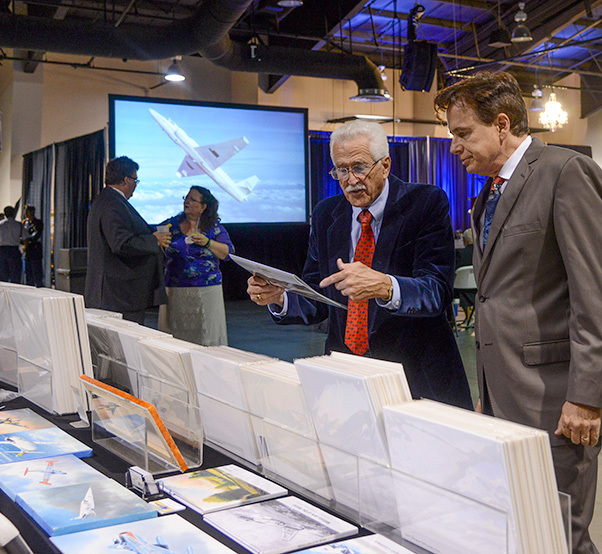 Aviation artist Douglas Castleman (right) talks about the SR-71 with a guest at the 2015 Gathering of Eagles. 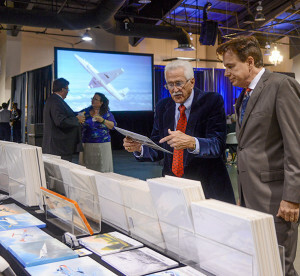 Castleman and other vendors donated a portion of their proceeds to the Flight Test Historical Foundation to benefit the project to move the Edwards AFB museum outside of the west gate to be more open to the public. “I experienced a flood of emotions during the recognition of his passing. Charlie was so influential in my life and the development of the Air Force Flight Test Center,” said Thomas Berard, who retired from the former Air Force Flight Test Center in 2011 as the executive director. The night ended with a panel discussion where the 2015 Eagles shared their experiences in the SR-71 and U-2. For more information about the Air Force Flight Test Museum or the Flight Test Historical Foundation visit www.edwardsmuseum.org.